Since the dawn of time, cats have always intrigued humans. Regardless of their size, we can watch a tabby stalk a fly, or a lion lie in wait for a gazelle with equal fascination. Perhaps their mystery and aloofness remind us that we, too, were once wild, uncivilized beasts. We admire them for their grace and beauty, and are grateful when we earn their love and trust. Here are some great docs that celebrate everything we love about cats of all sizes. 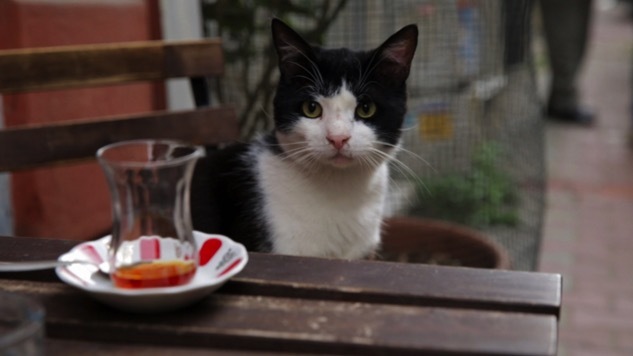 This delightful Turkish documentary gives us a cats’-eye view of what it’s like to be a footloose feline in Istanbul. The people who care for these feral kitties don’t attempt to own or control the independent creatures, they simply tend to their needs—as much as the cats will allow. These street cats don’t just represent the free spirit of the Turkish people, but the shrinking presence of nature. In Istanbul, as in every modern city, nature is losing ground to ever-creeping civilization. When we first meet the film’s subject, Dorian Rence, she’s walking down steep, snow-covered steps to feed feral cats under a bridge in New York City. She confesses that in 12 years, nothing has ever kept her from feeding the cats she’s named Maggie and Dexter —not even an accident that left her with broken bones. We eventually learn that this middle-aged cat lady is a distinguished member of the New York Philharmonic, and that Maggie the cat wasn’t named after a certain Elizabeth Taylor movie, but for Johann Sebastian Bach’s Magnificat. The film, made by a neighbor who witnessed Dorian’s trek every day to feed the cats, is as much about Dorian’s complicated life and the Philharmonic, as it is about the cats she dotes on. Her goal is to get the cats inside for this particularly brutal winter—if she can capture them. You’ll want to have tissues ready for this one. Thanks to the “Bouldercam,” a remote camera hidden in a rock, this documentary (culled from 3000 hours of footage) gets some incredibly close-up scenes of a lion family, including memorable images of dad playing with the kids, and lion cubs stalking birds. The classic narration from David Attenborough yields such gems as, “In parenting, lions are from the old school. They are not afraid of discipline.” Cue a lioness picking up one of her young by the scruff of the neck. If you’re okay with seeing lions at their predatory best, which includes taking down various zebras and wildebeests, this is a fantastic look at the kings of the jungle, in all their magnificence. This episode of The Nature of Things examines the science behind all things peculiarly feline, including night vision and that uncanny ability to land on their feet. It also explores many things you probably didn’t know about your pet kitty, including the fact that their hearing is even better than dogs—all the better to hear the high-pitched squeaks of mice. Samuel L. Jackson narrates this gorgeous DisneyNature doc, directed by veteran wildlife filmmakers Alastair Fothergill and Keith Scholey. It focuses on two big cat families on the African savanna: The River lion pride with aging mom Layla, cub Mara, and pride patriarch Fang; and single cheetah mom Sita and her five newborns. We watch as the cubs learn to navigate their world, rough-housing together and getting guidance (and regular tongue baths) from Mom. The shots of Sita running slow-motion are truly breathtaking, and there’s plenty of suspense in the rivalry between the elder Fang and his black-maned Kali. Since the emphasis is on family togetherness and less on bloody animal kills, the movie earns a very family-friendly G-rating.